On June 27, 1945, Flight Petty Officer 1st Class Jūjirō Kitamura died at the age of 21 when submarine I-165, which was carrying two kaiten manned torpedoes, was sunk by a US Navy patrol plane east of Saipan. On June 15, 1945, submarine I-165 made a sortie from Hikari Kaiten Base in Yamaguchi Prefecture with 104 crewmen and two kaiten pilots who were members of the Kaiten Special Attack Corps Todoroki Unit. All men on board died when the submarine was attacked. 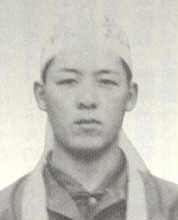 Kitamura was from Nagano Prefecture and was a member of the 13th Kō Class of the Navy's Yokaren (Preparatory Flight Training Program). He received a promotion to Ensign after his death, which was recognized by the Navy as part of a special (suicide) attack. Since soon will be farewell to life, I really want to see my parents, brothers, and sisters , but from the beginning this ended. I want to go to our old home in Nagano and to see Grandfather and Grandmother, but there is no free time. Aunt, now there is only one request for you. Tell my parents in Taiwan, "Above and beyond a child's thinking of his parents, I am thinking of the country." If you give only this message to them, I have no other regrets. The letter comes from Mainichi Shinbunsha (1968, 172). The biographical information in the first paragraph comes from Konada and Kataoka (2006, 272-5, 374-5), Mainichi Shinbunsha (1968, 172), and Mediasion (2006, 62-4, 85). 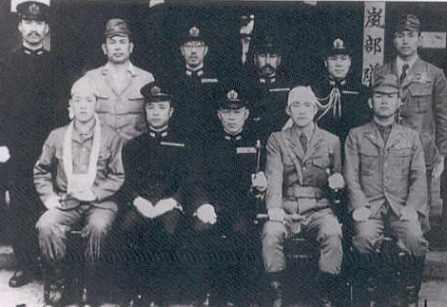 training at Hikari Kaiten Base on March 16, 1945. Mainichi Shinbunsha, ed. 1968. Seishun no isho: "Yokaren" senbotsusha no shuki (Last letters of youth: Writings of "Yokaren" war dead). Tōkyō: Mainichi Shinbunsha.